Squids and octopi are mesmerizing creatures when you can get a look at them. But that's not so easy thanks to their magical invisibility and camouflage powers. Sarah Zylinski and Sönke Johnsen of Duke University recently learned that the octopus Japetella heathi and the squid Onychoteuthis banksii become camouflaged when faced with bright light, then with a quickness switch to transparent mode when their environment is darker. These creatures live in the Mesopelagic zone, also known as the twilight zone, which exists between 600 and 1,000 meters under sea. Hardly any light makes it down there, except for light created by underwater animals themselves. The headlight fish (made famous by Finding Nemo), for example, wears his own jaunty lighting apparatus. 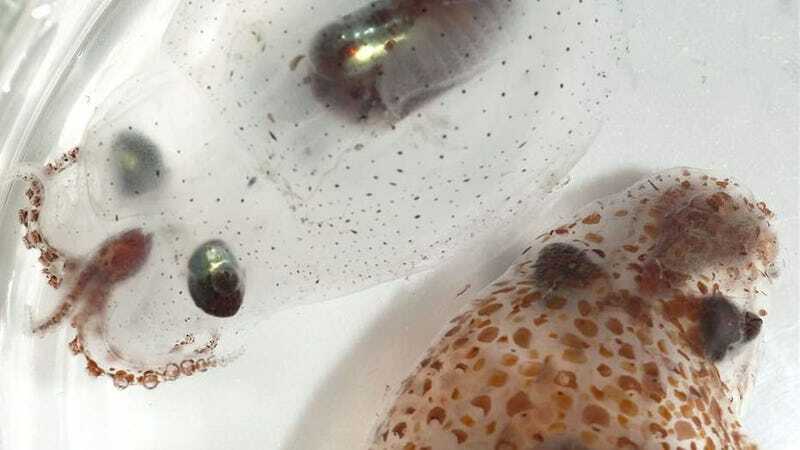 So to hide from predators that can illuminate dark waters as well as those that can see in the dark, these two cephalopods have the ability to become both transparent and darker to blend with their environment. Most can do just one or the other, so these guys are special. The researchers collected the two species of cephalopods from the coasts of California and Peru and shined blue light on them, the same frequency a predator fish would. In response, they expanded sacs of red pigment that covers their bodies, helping them blend into their surroundings. When they removed the light, they became transparent again.